Welcome to AREMENのなく頃に, a Mafia game pitting our venerable House Aremen, opulent and imperial, against the supernatural forces of the Golden Witch! ...or maybe the not so supernatural forces of a more conventional serial killer. You must find the truth. The date is October 4th, 1984. 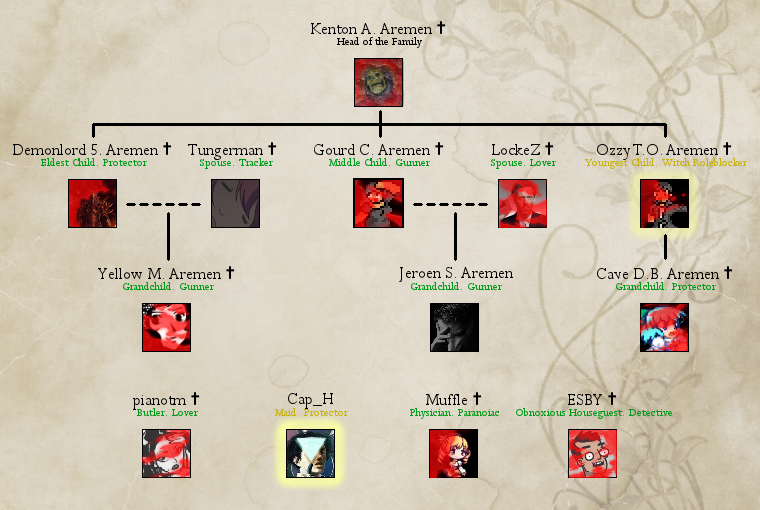 The head of the Aremen family, Kenton A. Aremen, has called a family meeting of great importance. Kenton Aremen is a very old (and very "eccentric") man whose health is failing, and it's rumored that at this meeting he will finally announce which of his three very greedy (and very disappointing) children will be the new head of the house on his death... and more importantly, he will finally announce what will become of the Aremen fortune. While Kenton made his money in indie games, he always tells a tall tale about how the seed money came from a mysterious person calling themselves the Golden Witch... but then again, there's a reason they call Kenton Aremen a lunatic. "Come quick! Kenton Aremen is dead!" Mafia is a forum game of informed minority (the Mafia) vs an uninformed majority (the Town). Each player is secretly assigned a team at the start of the game. Play starts in "day" phase, where town discusses who's likely to be mafia and votes against them, while the mafia tries to direct suspicion elsewhere. Then during "night" phase, the thread is closed and mafia discuss privately who to murder at night. Play alternates between these two phases until either town wins by catching all the mafia, or the mafia wins by outnumbering town. The hell is an Umineko? - Analyze the mechanics of a PMs for the moderator in comparison to other players, eg, "the fourth word of my role PM is 'town,'" or "my PM was sent at 11:23, when was yours?" To sign up, just post that you're interested. If you'd like to claim a specific spot in the family, you can do that too ("I want to be a grandkid/butler/cavedog's-husband") and I'll put you on the family tree. Any sort of servant flavor is fine and the stuff there now is just an example. Note this doesn't have any affect on the in-game role you'll get, but it will affect the flavor text at the beginning and end of each day. You can also request a stupid middle name like "battoru" or something. No experience required, new players welcome. Also, the game will be balanced to accommodate however many people sign up -- there's no hard upper bound so even if things look full (or empty) should be good to go. Hey all, long story short I'm currently knee-deep in a VN project and before I start another rewrite/editing pass, I could use some decent external feedback. The game itself: the WIP title is Snowbound. It's a short-medium VN (about 800kb script, 5 hours?) that takes place during a blizzard at an elite science academy in Alaska. The twenty or so students left behind are trapped. It's part survival story part thriller told from the perspective of Rebecca Bell, a junior with a habit for studying people, and Eric Larsen, a senior ex-honor student. They're joined by a large supporting cast, and half the story is seeing how the students react and interact when left to their own devices. Everything's complicated by the academy's setup -- most of the characters are very talented in their own right, but more interested in competing with each other than cooperating. The player makes some choices for both of the protagonists that affect whether the story follows one of two arcs. No dating sim trappings. I'm looking to release this project to gauge interest in a more ambitious, possibly commercial VN project, but this'll most likely be pay-what-you-want and free on RMN. The current state of the project: I've resurrected the script after dropping the project a few years back. I've written a VN engine in Unity (long story) and everything is working from a mechanical perspective, eg it's playable. However there's not really any art or sound and I'm looking at hiring out for resources fairly soon. The more immediate problem is that I want to rewrite the script again before then, with a finalized character roster for portraits. And what I really need for that is someone else's opinion on it. I'm looking to make some pretty serious changes already so just someone I can grill about what they liked/didn't like about characters, plot devices, etc would be invaluable. Ideally I'm looking for someone who's maybe familiar with the VN genre, or just reads a lot, or just someone that I know (or randomly posted at as the case may be) from around RMN. I'm prepared to offer some minor compensation (or code stuff, betatest, edit etc in return) but past that I'd consider it more of a token of appreciation than anything. Or at least an "I'm actually serious" guarantee haha. Well if anyone's interested, feel free to reply/PM. Thanks in advance! I figured I'd post this here as a heads-up for anyone looking to get into roguelike development that hasn't tried already. For those who haven't heard of roguelikes, the basic idea is that the entire game is procedurally generated, and once the player character dies, it's gone for good and the player restarts in a newly generated game world. I like a few of these games (ADOM especially) and it's sort of an underrepresented genre around here. So it's definitely possible to get something interesting, and if you screw up, who cares? It's only a week. So post if you've got ideas or might be interested. Hopefully there will be a couple RMN entries. I'll be working with Enker this year on a sci-fi roguelike. I'm currently working on a visual novel project (Project Snowbound, no real name for now) and I'm looking to commission/recruit/work with/hire someone to cover the artistic side of things. (I have writing/programming covered, possibly music as well.) Most of the work would be making character portraits. If you're interested in background art or CG, that's a plus. There's about a dozen characters total, and none of them have any sort of physical description or character art. I'd really love to have someone talented in character design. Right now the game's about halfway written and halfway creatively matured. Characters are set and scenario is pretty well-planned, and there's an 80,000 word script so far, but there's still a lot open. I have no visual style in mind, and I'd also be glad to have someone to bounce ideas off for a few finer story points. Ideally, I would been making this topic at the very beginning of the project, but somehow, it never really happened... Current status and story/character material can be found here: http://www.wombatrpgs.net/snowbound.php. If you need a writing sample, there's always The LCPANES Terminal. As for compensation... I'm expecting to probably just pay up front per portrait, but there are a lot of options. If all goes well, there will be a paid mobile release and royalties should be expected. If I were recruiting a year ago, I probably would've just put up 50/50 revenue no commission, but at this point I realize that's not very feasible. What I'd really want is a partner in the project more than a hired hand, with the possibility of working on future projects. I'm very particular about actually completing games (check my profile) and this project /will/ be finished. If you're interested, it shouldn't be too hard to work out payment specifics. Myself and the WombatRPGs crew (mostly bob_esc, Oreoiorio, and quack_tape) have been trying our hands at Let's Try videos. We've tackled a few games so far, and we've been playing around with formats. Right now it's me driving with a guest commentator or two helping out. We're looking into ways to format this with multiple people playing as well as having a livestream channel open for people to make comments as we play. This has been happening inside the WRPGs IRC channel mostly, but as this goes on we'll probably open it up. As it turns out, these things are much more fun to do with one person! Also, we've cleared up the queue of games (aside from Asylum of Pleasure and Pain, still waiting on that) so we're open to suggestions of what to taken on next. We're open to most games and genres; someone here will probably enjoy it...! And the actual music, in reverse chronological order. ambient_underwood - I'm getting away from Musagi's default instruments and into VSTIs; I can't find very many good ones. Did find a typewriter though. highly_unresponsive - Named and inspired for Musagi's annoying tendency to randomly jerk around the song as it eats my CPU. last_yesterday - Pretty standard. Okay melody. c64_ugly - I'm not really into chiptune stuff, but something about that C64 slide is just perfect. The sledgehammer-like percussion is not. derp_scales - Pretty self-explanatory, but it's more interesting than it sounds. Hi, I'm with the WombatRPGs team working on Blockbound. a medium-length adventure game in GameMaker. We're looking for a composer to join the team. Basically, the game is in full production and we're getting very close to a demo... Sprirting, tiles, portraits, mapping, and dialogue are all done, and the only things preventing a release are a few programming items and the entire soundtrack. Our original composer made half a track and then quit because he got a full-time paying job making music... (lucky). The style, if you couldn't guess by the game info, would be pretty light. I suppose 8bit style would be alright, but non-chiptune stuff would be preferable. I can give style examples and other specifics to anyone interested. About 5-6 tracks would be needed for the demo, and double that for the full game. If you're worried this game will assume the usual team project status of "cancelled/infinite hiatus," I've led several team projects to completion before, and I fully intend to complete this one as well. If you're at all interested, either post here, send me a PM, email me at psy_wombats@wombatrpgs.net or I'm on AIM at psywombats. I can get to you with more details and that sort of thing. Thanks for your help. Though my personal favorites have to be "The Dragon-riding Zombie" and "Lingering Temple of the Imperishable Chronology." What other horrible stuff can people come up with? Basically, I'd love to know if anyone had any solution to this, or would be willing to share how they recorded videos of RM2K/3 games. This would be the polished version of what I threw up on Release Something Day. EDIT: Fixed the bugs. Sorry if it crashed on anyone... EDIT: Now RTP is bundled. Sorry about that. Qoppa is a loose federation of lab overseers and administrators. Not too long ago, a researcher made a "discovery" on a lab in Planet Corinth. This creation was promptly destroyed. To prevent the secret from being rediscovered, Qoppa slowly cut off communication between labs on different planets, using the Master Server on the space station Eris to shut down communication lines. Only one free research base remains. This is on the planet Corinth. The resistance group Terra Nova is the only group making independent inquiry in the known worlds. Qoppa seeks to destroy it. 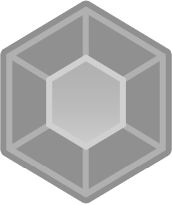 The goal of Terra Nova is to free the research facilities on other planets and ultimately destroy the Master Server on Eris. Tau wakes up in the Terra Nova lab with no recollection of who he is or what he is doing there. It seems that he is a soldier developed by Terra Nova to assist in guerilla operations against Qoppa. He gradually learns the truth behind the men who created him, and the fate of his predecessor cyborgs, Omicron and Rho. Tau is the result of Project Tau, a cyborg-soldier creation program of Terra Nova. Instead of an organic brain, Tau possesses a portion of the Master Server, stolen from Qoppa. According to his creators, he is the perfect solider: engineered for power and speed, with a sharp and calculating intelligence from the Master Server. Tau initially does not see the reason behind the struggles of Terra Nova, though he changes as he receives information from the Master Server in his brain about Voltaic, a co-founder of Terra Nova. Tau is obsessed with the other cyborgs before him, Omicron and Rho. Chief is a co-founder of Terra Nova, initially a member of the Qoppa Directors Board. He split with Qoppa after supporting the plight of the researcher who uncovered the forbidden discovery. He is devoted to the Terra Nova cause. Though slightly distant from Tau, he is forced to rely on him to fight the battles of Terra Nova. Bruno is a Terra Nova scientist on Corinth, the primary developer of Tau. He is slightly conceited, but very proud of Tau. He considers Tau a machine only, but also his magnum opus. He takes a genial attitude towards his welfare and shows off to the other scientists. Another Corinth-based Terra Nova researcher, Eliza is a psychologist on Project Tau. She shes Tau as a human, not a machine. She is the most compassionate towards Tau and the most attentive to his wellbeing, not just as a soldier. She has an antagonistic relationship with Bruno, who is technically her superior. Omicron was a beta version of Tau. He used to have Tau's job, but is apparently dead. No one on Corinth speaks of him, though Tau is fascinated by his fate and seeks to discover what killed his predecessor. The cyborg Rho, and earlier beta, seems to have served the same purpose, but also is mysteriously absent. The wife of Voltaic. She was a member of the Planet Nyx Resistance before it was destroyed by Qoppa. She died in the aftermath. The ABS of Eyes of the Machine is similar to the 2D Zeldas, or else a different perspective of Mega Man Zero. Tau enters the battlefield and must reach the boss at the end of the planet. The decision whether to defeat the Qoppa soldiers or flee is up to the player. Tau possesses several weapons given to him by Bruno. Laser Partisan - Press SPACE - Executes one of several standard attacks. While standing still, the Sweep Attack is executed. While running, Tau performs a Jab attack. Attacking in midair causes the Slam-Jump Attack. Holding down the spacebar and releasing performs the Spin Attack. Projectile Shield - Hold CTRL - Absorbs projectiles fired by gunners. NOTE: Controls may be customized in-game.